Gusseted bags feature creased sides that expand to accommodate bulky items. Low Density Polyethylene (LDPE) bags are the most commonly used plastic bag because they provide excellent protection and outstanding value. Elkay polyethylene bags are made from virgin materials, so they comply with FDA requirements for use in food applications. Gusseted General Utility Plastic Bags are used for storage and transport packaging of items where bag volume must expand to comfortably accommodate the contents. They can be used for virtually any general Industrial packaging application, but are especially well suited to handle bulky products, components or raw materials. Open-ended bags can be taped shut, heat sealed or closed with a twist tie. 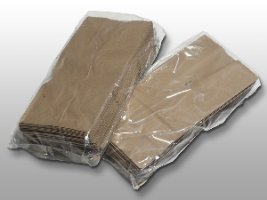 Elkay gusseted polyethylene bags comply with FDA requirements for food contact. Gusseted General Utility Plastic Bags are used for storage and transport packaging of items where bag volume must expand to comfortably accommodate the contents. They can be used for virtually any general Industrial packaging application, but are especially well suited to handle bulky products, components or raw materials. Open-ended bags can be taped shut, heat sealed or closed with a twist tie. Elkay gusseted polyethylene bags comply with FDA requirements for food contact.These bags are not autoclavable nor are they intended to be leak proof.